Former Ducks defenseman Ruslan Salei was among the members of the Kontinental Hockey League club Lokomotiv that died when their plane crashed shortly after takeoff near the city of Yaroslavl in Central Russia. Among the at least 43 people who died in the crash were several former NHLers, including coach Brad McCrimmon, Pavol Demitra, Karlis Skrastins, Josef Vasicek, Karel Rachunek, Jan Marek and Alexander Vasyunov. Salei was 36 and left behind a wife and three children. Salei was drafted by the Ducks in 1996 and played nine seasons in Anaheim before leaving as a free agent following the 2005-06 campaign. Nicknamed "Rusty," he ranks fourth in team history (and first among defensemen) in games played with 594, and scored one of the biggest goals in Ducks history, an overtime game-winner in Game 3 of the Stanley Cup Final against New Jersey on May 31, 2003. After leaving the Ducks, Salei spent close to two seasons with the Panthers before being traded to Colorado at the trade deadline in 2007. He spent two more seasons with the Avs, and last season reunited with former Mighty Ducks coach Mike Babcock in Detroit, where he had two goals and eight assists in 75 games. After playing 917 NHL games in 14 seasons, plus 62 postseason games, he signed with Lokomotiv in July. During his time in Orange County (where his family has kept a home), Salei was beloved by Ducks fans, who gave him a standing ovation following a video tribute during his return to Anaheim with Colorado in 2008. Many of those fans expressed their condolences on Facebook and Twitter, while some came to Honda Center to build a shrine outside the arena (click photo at right). “He was a really good friend of mine and we always kept in touch. We played cards together a lot and had many dinners together. I was so sad to hear about this and I still can’t believe it. "This is a dark day for everyone. He was such a great guy, a real team guy, always chirping. The kind of guy you really want in your dressing room." 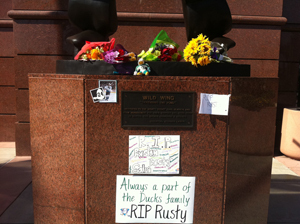 “Rusty was great. He was the type of guy, when he came into the room, he could lighten it up with a joke or with just the way he talked. His personality was infectious. He just had this way about him. He didn't back down from everybody. He was always a guy who would stand up and hold people accountable. He was a great teammate and certainly a great friend. It's just a tragedy that his life had to end so soon." “My nickname on the team was ‘T-Bone’ and he used to call me ‘Ribeye." For whatever reason, he always called me ‘Ribeye.’ We got along great. We would always go out to dinner. He always was the type of guy who wanted to be around the team and his teammates. He and I actually kept in contact periodically after he left the team when he was in Florida, Colorado and last year in Detroit. He will be sorely missed. Our thoughts go out to his family." “He was a great guy and we had a lot of fun together. I remember plane rides after games, playing cards, having fun and hanging out. It’s so sad. I heard the news this morning after I got up. You turn the computer on and it’s the first thing you see. You think of his wife and their three kids. It’s just a sad day."